What do people with XMRV (and related human gamma retroviruses) have in common? 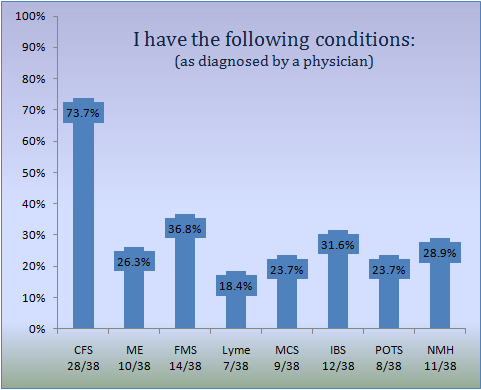 The XMRV Positive Survey was launched on May 12th 2010 on International ME/CFS Awareness Day. The initial response was good. Thanks to the 25+ people who took the time to answer the survey questions in the first few weeks. Over the summer, the survey was not very active. The surge of XMRV testing that had happened between December and February 2010 had slowed down. Patients in the U.S. were waiting until a serology test became available. Patients in Europe waited too. The proprietary XMRV co-culture test that Red Labs has licensed from the Whittemore Peterson Institute has only recently become available. Now patients are starting to get tested again. In an email, a representative from VIPdx reported that already more than 1000 test kits have been requested. We anticipate that over the next few months, hundreds of people will learn that they are infected with a human gamma retrovirus. If you are one of them, we invite you to take the XMRV Positive Survey. You will be contributing to a growing understanding of how XMRV and MLV-related viruses are associated with disease. As of September 18, 2010, 38 people have completed the survey. This is what we know about them. I would like to see GWI added to this survey. They need to know! @kathryn Yes! Good idea. We'll be making a few minor changes to the survey over the next few days and will add GWI as an option for the "I have the following conditions:" question. May I suggest adding the names of conditions in full somewhere. What is MCS? Thanks G.L. @ G.L. - Abbreviations have been added. MCS = Multiple chemical sensitivity. Thanks for the suggestion. @kathryn - The survey has been modified to include GWI as one of the possible conditions that have been diagnosed. Also added were 'military base' for the question of location at time of onset and 'military deployment' for the question about what triggers may have contributed to onset. Great stuff here. Glad to find out about mecfsforums.com, too. Good technical info. Thanks for posting! Can we link up with wpi on facebook. To get other xmrv + surveys? Or are you already working on it. Looks like im the only one from norway! Haha. Can we see the graphic lines of other symptoms? Not just the diagnosis. Keep up the good work, Thanks! Copyright, 2010. XMRV+ Positive Survey Team. Watermark theme. Powered by Blogger.